The concept of love has fascinated Homo sapiens since we first started experiencing those warm mushy feelings. Ever since then, painters and writers and actors have found avenues to express the ways that love makes them feel. Now, scientists are discovering what happens in the brain that creates the compulsion for monogamy that many believe Hallmark cards tricked us into thinking we needed. For my project, I am studying the changes in the brains of zebra finches that lead to monogamy. Of course, what we know as “love” has been socially constructed by humans, so technically I am studying what scientists call “pair-bonding” in monogamous birds. Research in voles, another monogamous species, has shown that there are increases of dopamine receptors in the part of the brain associated with rewards when voles have been pair-bonded for long amounts of time. Dopamine receptors bind dopamine—a neurotransmitter responsible for many feelings and movements, including pleasure—and send messages to other parts of the brain—for example, “This candy is delicious, let’s keep eating it!” or “I am in love with this other bird, let’s see if she is interested in mating!” Specifically, the number of dopamine 1 receptors increased the longer that voles were paired, and activation of these receptors also caused males to be disinterested in females that weren’t their mate—and dopamine 2 receptors increased when the pair-bonding was first happening (Aragona et al., 2006). Basically, the activation of dopamine 2 receptors caused the voles to “fall in love,” and the dopamine 1 receptor activation maintained the love over time. This connects to zebra finches because my PI, Dr. Coleman, has shown that by using chemicals that activate the dopamine 2 receptors manually, a scientist can induce partner-preference in zebra finches—sort of like a “love potion,” that makes zebra finches “fall in love”! The same method was also performed in Aragona et al.’s 2006 paper, where partner preference was induced in voles. This research is one of the final pieces in Dr. Coleman’s project about the mating preferences of zebra finches. You might be wondering—who cares about the love lives of zebra finches? I can name one famous person you might recognize who would be very interested in this research: Charles Darwin. This research furthers Darwin’s theories of sexual selection—what traits are sexually attractive, and should be passed down? How does the brain “fall in love”—in other words, how does the brain select a mate, one of the most important decisions in any organism’s life, especially if the organism is monogamous? Our preliminary results do not indicate an increase in neither dopamine 1 nor dopamine 2 receptors in paired birds compared to sexually naïve birds. Instead, we are seeing an increase in the enzyme tyrosine hydroxylase, which helps make dopamine. 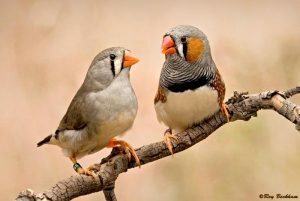 This result suggests that, in zebra finches, there may not be a change in the number of receptors, but instead just an increase of the neurotransmitter itself. We plan on continuing the experiment, and looking in several parts of the brain to see if there is an increase in a different area. I think the most important thing for people to realize about the day-to-day lives of scientists is that we aren’t discovering gravity or the cure to polio every day. Some days are a wash, literally—regularly deep cleaning our bird room is one of the great joys of research. But some days are great, like when you finally manage to perfect that technique that you have been struggling with for weeks. I feel like an expert with the cryostat and subbed slides—there’s no better feeling than doing something easily after practicing for months. Slicing tissue is like riding a bike—you never forget. It’s important to learn as much as you can from people who know more than you, but it’s equally important to teach. I think a lot of people tend to think that scientists isolate themselves in their lab, barely ever emerging for food or sleep, laughing maniacally whenever their experiment works. Actually, that sounds pretty accurate, now that I have it all written out. But I guess scientists tend to not isolate themselves completely—we usually have a lab partner or a collaborator working with us. So it’s more like, you barely emerge from your lab for eating or sleeping, you laugh maniacally, and your lab partner is the last person you spoke face-to-face with in the past 3 days. Joy! (Of course, I’m being sarcastic. It’s been 5 days!). I have a new appreciation for the power of collaboration. And I think that is why the image of a scientist toiling alone in a lab bothers me so much—it ignores the fact that all scientists rely on others, and have others who rely on them. Perhaps if Frankenstein got his research peer-reviewed, his life would have gone very differently. As Newton said, “If I have seen further, it is by standing on the shoulders of giants.” Having stood on the shoulders of many giants myself, I look forward to the day that I can be a “giant” for another young scientist. 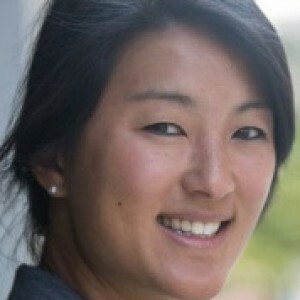 Aragona, B. J., Liu, Y., Yu, Y. J., Curtis, J. T., Detwiler, J. M., Insel, T. R., & Wang, Z. (2006). Nucleus accumbens dopamine differentially mediates the formation and maintenance of monogamous pair bonds. Nature Neuroscience, 9(1), 133-139. DOI: 10.1038/nn1613. 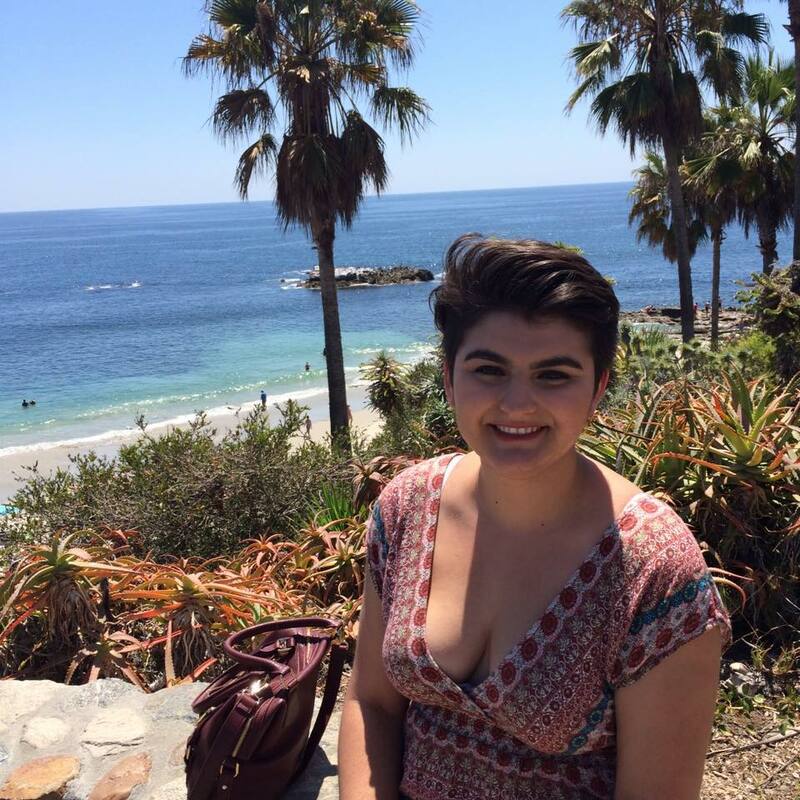 Lauren Eisenman is a senior majoring in cellular/molecular neuroscience at Scripps College in Claremont, California. She is a 2017 Integrative Organismal Systems Physiology (IOSP) fellow working in Dr. Melissa Coleman’s lab at the W.M. Keck Science Department in Claremont, California. This summer, Lauren is funded by the APS and a grant from the National Science Foundation Integrative Organismal Systems (IOS) (Grant #IOS-1238831). In the future, Lauren plans to attend graduate school in a neuroscience program and pursue a career in academia. This summer, I received an American Physiological Society Short-Term Research Education Program to Increase Diversity in Health-Related Research (APS STRIDE) fellowship. This fellowship, funded by APS and a grant from the National Heart, Lung and Blood Institute, allowed me to do 10 weeks of research at the University of Missouri. I focused on how aldosterone can decrease adenosine-induced coronary vasodilation, an important cardioprotective mechanism. 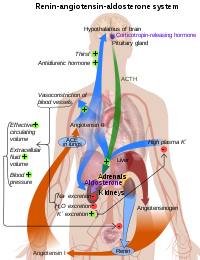 Aldosterone is a steroid hormone which is associated with activation of the renin-angiotensin-aldosterone system (RAAS) (Klabunde, 2016), and adenosine is an important compound which has numerous roles in the body. This concept becomes important during heart attacks when adenosine would ideally increase dilation (widening) of heart blood vessels to increase blood delivery to damaged areas (Chen et al., 2013). Increased RAAS activation increases levels of aldosterone which ultimately decreases this protective mechanism, and the infarcted areas do not receive the blood they need in order to be protected. I will be exploring how aldosterone performs this action and whether it acts on one of the two main adenosine receptors in question: A2A and A2B. Individuals with high RAAS activation have higher levels of plasma aldosterone as well as a higher risk for heart attack, so understanding this pathway can be beneficial for those individuals. I used mice as an animal model and I am hoping that a better understanding of this mechanism can help humans with heart damage. We increased plasma aldosterone in the mice by implanting osmotic mini pumps that infused aldosterone over a course of 4 weeks. Afterwards, we dissected coronary artery rings and measured vasodilatory (vessel widening) responses to a few vasodilators and specific agonists of the A2A and A2B receptors. This was done by mounting the rings in a muscle force measuring machine (wire myograph) and collecting data on their isometric tension production. We followed up these experiments with PCR (Polymerase Chain Reaction used to amplify segments of DNA), DHE staining (Dihydroethidium used to detect reactive oxygen species), and western blotting (identification and measurement of proteins). Spending the summer as a STRIDE fellow was a really amazing experience for me. I’ve always been very passionate and interested in research and this summer was a reaffirmation of that. I enjoyed being involved in the project and working as a part of a team. This fellowship was incredibly helpful because we were able to network with other fellows from all over the country. We also completed regular assignments that strengthened our critical thinking, writing, and communication skills. I express my sincerest thanks to APS and the Bender lab for this opportunity! 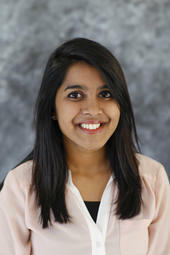 Maloree Khan is a senior majoring in Biochemistry at the University of Missouri. She is a 2017 APS STRIDE fellow working in Dr. Shawn Bender’s Lab at the University of Missouri Department of Biomedical Sciences. Khan’s fellowship is funded by the APS and a grant from the National Heart, Lung and Blood Institute. This summer, I was fortunate enough to continue my research through the American Physiological Society Undergraduate Research Excellence Fellowship (APS UGREF). Their support, along with that of my mentors, has allowed for a unique and interesting project to progress- the investigation of high-dose vitamin C and hyperbaric oxygen therapy (HBOT) for cancer treatment. While the mention of vitamin C for cancer may invite skepticism, the literature teems with evidence that supports additional research exploring vitamin C as a supportive piece of an integrative cancer treatment plan. Fascinatingly, vitamin C can affect the body differently when taken as a supplement (orally) versus administered clinically (intravenously). 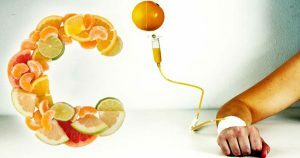 When given intravenously, vitamin C can actually act as a “pro-oxidant” in cancerous tissue, meaning that it can increase levels of highly reactive oxygen-containing molecules that can stress and sometimes kill cancer cells. Interestingly, with vitamin C, this pro-oxidative effect does not appear to take place in normal cells, making it likely safe for patients that are suitable candidates. HBOT, a medical treatment for severe wounds and other health ailments, delivers 100% oxygen at elevated pressure, suggesting that it may increase the pro-oxidative, anti-cancer effects of vitamin C. So far, we have seen compelling results in isolated mouse brain cancer cells, particularly that high concentrations of vitamin C (> 0.5 millimolar) kill ~80% of cells after 24 hours of treatment and decrease their growth, and that HBOT can enhance these anti-cancer effects. We are also in the process of running additional studies to better understand how these therapies work in combination (i.e. quantifying oxidative stress, studying expression of proteins relevant to cancer), with the ultimate goal to potentially improve patient care. Aquanauts move across the ocean floor similar to how they would across an asteroid. Photo Credit: NASA. 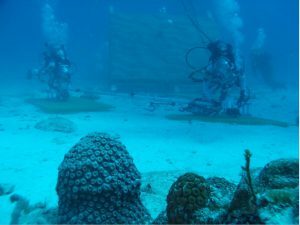 While concurrently working on my honors thesis, I also had the opportunity to assist with data collection for NASA Extreme Environment Mission Operations (NEEMO) 22 on which my mentor, Dr. D’Agostino, was a crewmember. On this mission, crewmembers live ~60 feet underwater as “aquanauts” at the world’s only undersea laboratory, Aquarius. The goal of NEEMO is to simulate a space flight mission, simultaneously allowing researchers to study the effects of saturation on human physiology. Saturation refers to the aquanauts’ tissues being saturated with nitrogen at a pressure 2.5 times greater than the atmospheric pressure of air at sea level. Before they can return to the surface after the mission, the aquanauts must “decompress” for about 17 hours, where the habitat is gradually depressurized and the crew breathes 100% oxygen for about an hour in total; the latter process is similar to what my cancer cells go through when I put them in a hyperbaric chamber! Our research group looked at the effects of chronic saturation on body composition, autonomic function/dysfunction (heart rate variability and sleep), the gut microbiome (genetic makeup of bacteria in our gastrointestinal tract), and cognition/sensory motor function. It was a great opportunity to learn more about the future of space exploration, research the effects of extreme environments on human health, interact with astronauts, and to work with such a brilliant team of individuals. It’s really incredible to think of how science has positively impacted my life; growing up, I never imagined myself working in a research lab, let alone becoming a scientist. After having the opportunity to immerse myself into the scientific research culture, however, I do not know if any other path would have been as gratifying and intellectually stimulating. It has been enlightening to see the level of dedication and knowledge required of scientists to run a lab, design experiments, analyze data, and translate scientific discoveries to improve the lives of others. Performing research in a lab requires a great deal of patience and perseverance; as a scientist, one must accept the fact that failures are inevitable, but that each setback may illuminate new pathways and discoveries that would have otherwise remained hidden. I am constantly challenged in the lab, always learning new techniques and understanding that methods, theories, and questions are constantly evolving. I continue to find literature that influences my perspective and approach to research and have great appreciation for the guidance I’ve received on my journey, as well as for the techniques available to decipher our most deep-rooted inquiries. Whether counting cells under a microscope or “diving” cells in a hyperbaric chamber, I am grateful for all the amazing experiences, mentorship, support, and insight research has given me, and hope that other students have similar opportunities to unveil their passions and learn more about the world. Janine DeBlasi is a senior cell and molecular biology major at the University of South Florida (USF) in Tampa, FL, where she works as an undergraduate research assistant in Dr. Dominic D’Agostino’s laboratory. 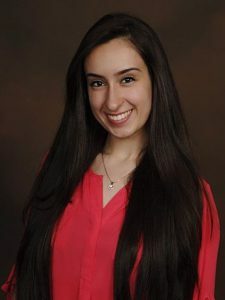 She is a recipient of the Undergraduate Research Excellence Fellowship supported by the American Physiological Society and has plans to pursue a career in translational medicine and cancer research. Estrogens are associated with protection against cardiovascular disease in women; however, past research on this question has typically focused on lean women. My goal for the summer was to investigate how estrogen affects cardiovascular health among young obese women. To investigate a woman’s underlying cardiovascular health, I used Ultrasound to visualize the brachial artery in her upper arm to measure its response to different stressors. I tested each woman’s arterial responses at her natural hormone levels, and then again after she had taken a week of estrogen pills. I hypothesized that obese women have underlying cardiovascular health impairment relative to lean women, but that estrogen treatment can reduce this dysfunction. 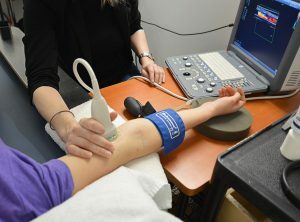 The Ultrasound probe is placed over the subject’s brachial artery. The image on the Ultrasound screen displays blood flow through the artery in red. Image courtesy of Women’s Health Research at Yale. This summer, I learned that data analysis can be much more time-consuming than the data collection itself, and that scientists often have to analyze their data more than once. When I first joined the lab, we acquired a new software program to analyze our Ultrasound data. I worked on piloting the software so it could be used to meet our lab’s goals, and developed a PowerPoint presentation and a detailed guide so that future lab members will be able to use the software to obtain accurate results. After I finished analyzing my data, I read a recent paper that used a similar program, but analyzed their data in a way that seemed more objective than the technique I had developed. I went back and re-analyzed all of my own data and re-wrote the How-To guide. It took a lot of extra time, but it was worth it to me to feel confident in the accuracy of my results. My job often demanded empathy and adaptability in order to record accurate data from living, breathing human beings. For example, our participants have to stay as still as possible for a couple of hours so we can obtain accurate measurements, so I always ask if there’s anything I can do to help them feel more comfortable. One day, a participant’s allergies were acting up, but both of her arms were immobile because of the equipment we were using. I ended up blowing her nose a few times between trials…My favorite part about being a scientist is that I can always continue to learn about new techniques to refine my work as I go. I enjoy reading papers so I can apply different methods and ideas to my own questions. My goal is to think creatively and design innovative experiments that illuminate the underlying physiology in interesting new ways. Celermajer, D. S., Sorensen, K. E., Gooch, V., Spiegelhalter, D., Miller, O., Sullivan, I., . . . Deanfield, J. (1992). Non-invasive detection of endothelial dysfunction in children and adults at risk of atherosclerosis. The lancet, 340(8828), 1111-1115. Miner, J. A., Martini, E. R., Smith, M. M., Brunt, V. E., Kaplan, P. F., Halliwill, J. R., & Minson, C. T. (2011). Short-term oral progesterone administration antagonizes the effect of transdermal estradiol on endothelium-dependent vasodilation in young healthy women. American Journal of Physiology – Heart and Circulatory Physiology, 301(4), H1716-H1722. doi:10.1152/ajpheart.00405.2011. Olson, T. P., Schmitz, K. H., Leon, A. S., & Dengel, D. R. (2006). Vascular Structure and Function in Women: Relationship with Body Mass Index. American Journal of Preventive Medicine, 30(6), 487-492. Torgrimson, B. N., Meendering, J. R., Kaplan, P. F., & Minson, C. T. (2007). Endothelial function across an oral contraceptive cycle in women using levonorgestrel and ethinyl estradiol. American Journal of Physiology – Heart and Circulatory Physiology, 292(6), H2874-H2880. 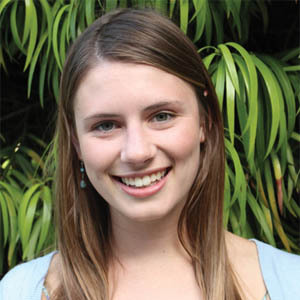 Tessa Adler recently graduated from Yale University in New Haven, CT with a degree in Ecology & Evolutionary Biology. She received an Undergraduate Research Excellence Fellowship funded by the APS to continue her research in Dr. Nina Stachenfeld’s lab at the John B. Pierce Laboratory in New Haven, CT. Tessa plans to pursue a career as a medical scientist focusing on the interactions between reproductive hormones and women’s cardiovascular health.